You can easily walk around the World Heritage zone as they are all interconnected and very near to each other. 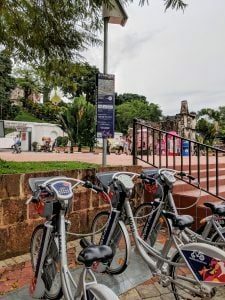 You can cover the Stadhuys, Jonker Street, A Famosa, St Paul Hill and end up in the shopping centres Dataran Pahlwan and Mahkota Parade all by foot. NEW: You can join the Melaka Free Walking Tour by JomMelaka which will cover the UNESCO World Heritage City by foot within 2+ hours. Melaka is a bicycle (Malay: basikal | Chinese: 脚踏车) friendly city with many designated cycling lanes. You can hire a bike from many establishments ranging from hotels and guesthouses to convenience stores. Bike sharing initiatives like MelakaBikeShare by the MBMB city council is also available. The local buses (Malay: bas | Chinese: 巴士) in Melaka is called Panaroma Melaka (Routes & Schedules). The buses start and end their journey in Melaka Sentral Bus Terminal. The entire fleet of buses by Panaroma Melaka is fully airconditioned and the fares are very affordable. Melaka is served by the ridesharing company called Grab. They have a very extensive driver networks so you will be able to hail for them almost anywhere within the city. 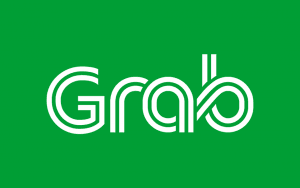 Grab offers a fixed upfront fee depending on the distance of your destination as well as the current traffic condition. FREE Grab Ride: Register for Grab with the referral code GRABFREEPROMO3 to receive RM3 OFF! Melaka used to be served by Uber as well but they’ve merged their South East Asia’s operation with Grab. Local taxis (Malay: teksi | Chinese: 德士) can be hailed from roadside or booked with the Grab ridesharing app (which doubles as a taxi hailing app). While all taxis are equipped with taximeters, some taxi drivers will not use them but will instead will offer an upfront fee. Expect to haggle for a lower price as the price offered can be quite high, especially if you are a tourist or during peak seasons or bad weather. Driving in Melaka is still one of the most convenient ways to move around as Melaka’s road network is very extensive. Most of the major roads outside of the historical areas are wide and comfortable but within the roads heritage zone are small and narrow so extra care will need to be taken while driving. Expect heavy traffic during the weekends (Friday, Saturday and Sunday) as tourists around the world descend on the UNESCO World Heritage City. Roadside parkings are aplenty and you will need to display the local council (MBMB and MBHTJ) parking coupon on your car dashboard. The parking coupons are sold in most shops and they come in booklets (each individual coupon is either for 30 minutes at RM0.40 or 60 minutes for RM0.60). You can also use the SmartParking Melaka app (Apple App Store | Google Play Store) instead of the coupon. Paid parking hours are from Monday to Friday, 9.00am to 5.00pm. Weekend parking is free of charge. There are a lot of private parkings as well and they usually charge a fixed price per entry (between RM2 to RM10 depending on location and timing). Trishaws (Malay: beca | Chinese: 三轮车) used to be an important public transport in Melaka before the advent of cars and motorcycles. It is now mainly used as a tourist ride around the heritage zone but if you are lucky, you may still stumble upon trishaw pullers who are willing to transport you around the city. The first phase of Melaka Monorail covers 1.6km along Melaka River from Taman Rempah in Pengkalan Rama to Kampung Bunga Raya Pantai. The Melaka Monorail operates from 10.00am to 10.00pm on weekdays and 10.00am to 12.00 midnight on weekends.